Today I delivered my second Toastmasters speech. The theme was about our new road buddy but with a twist. I enjoyed writing it because it gave me the opportunity to talk about important topics that interest me while name-dropping Tesla at the same time. I guess my fellow Toastmasters enjoyed it because I was voted again as best speaker 🙂 This inspires me to keep on going and continue to improve my speaking ability. Below is the transcript of my speech. I added some links for more context and opportunity for deeper exploration by curious readers. Enjoy. My wife and I are expecting a baby soon. That’s why a baby-friendly ride has become a necessity. So we’ve finally decided get a new car. Just last week we bought a 2010 3rd Generation Toyota Prius Hybrid. Its biggest selling point: fuel economy. With EPA rating of 51 miles city and 48 miles highway, the 3rd generation Prius is the most fuel-efficient mass-produced car on the market today. I’ve been driving it for a week now and the mileage is just awesome. It could actually run more than 500 miles on a full tank of gas (11.9 gallons). To give you a better picture, consider this: I can fill it up on a weekend, drive from Kirkland to Vancouver, Canada, and back, twice, and still have enough gas to drive back and forth to work, for the whole week! As you can see, in just one week I’ve become a certified agog Prius geek. However, as much as I love our new hybrid car, I can’t help but feel disappointed about the state of the automotive industry. Hybrid cars are like fax machines. It’s transitory technology. The future of cars is really electric — zero emission; zero fuel consumption. Why we’re still dependent on fossil fuels to power our cars, I can only guess. But according to the 2006 documentary, Who Killed the Electric Car?, the U.S. had its chance to transition to electric cars during the 1990s, but it blew the opportunity. The implication of the documentary is that politicians, General Motors, and the oil industry all conspired to bury the EV1 — GM’s electric vehicle. It’s a tragic story. Go see it and weep. But then again there’s no need cry. Fortunately for us, there’s a new breed of hot shot young entrepreneurs who understand that our dependence on fossil fuels is not only unsustainable, but also quite insane. That’s why electric cars are coming back with a vengeance. Take for example, Tesla Motors. In 2006 Tesla Motors unveiled the Tesla Roadster. It’s a fully electric sports car that could go up to 244 miles in single charge. Base Price: $109,000. Too pricey for me. But just last March (2009) Tesla Motors unveiled Model S, a fully electric sedan that could go up to 300 miles per charge. They plan to mass-produce it in late 2011 with a base price of $57,000. I don’t know about you, but it’s still too pricey for me. But, hey, rich people are falling in line to buy them. So bless them all for keeping the electric dream alive. Electric cars are good. Electric cars are beautiful. But by itself it’s not enough of a solution. If we want to have an impact on global emissions, electric cars not only have to scale, but the whole transportation infrastructure also has to radically change. Thanks to people like Shai Agassi, CEO of a company called Better Place, for leading the way in turning the transportation infrastructure on its head. His company has radical plans to take entire countries oil-free by 2020. 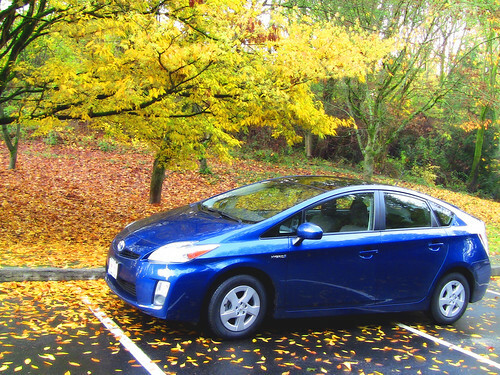 If and when Better Place succeeds, maybe then we could retire our Toyota hybrids. Call me a dreamer, but with the exponential pace of technology, I believe that someday our children’s children’s grandchildren will finally live in a world that Nikola Tesla had envisioned — a world where machines are powered by energy obtainable at any point in the universe. But, until then, by driving a hybrid car, I believe that we’re doing our share, no matter how small, or even negligible the impact is. Don’t get me wrong. I’m no hippie. I’m no die-hard environmentalist. I’m just a happy owner of a Toyota Prius. It’s not fully electric, but I still love it. My wife loves it. And I’m sure that our baby boy will soon appreciate its smooth, safe, environmentally-friendly, one hell of a sweet ride. P.S. Speaking of Shai Agassi, check out this video on FORA.TV – The Electric Horizon. and I find it very troublesome to tell the truth nevertheless I’ll definitely come again again. This was posted by c4chaos on Wednesday, November 18th, 2009 at 10:12 pm. Bookmark the permalink.